This is the back cover of issue 2 of the comic anthology series ‘Chad in Amsterdam’, an autobiographic comic series, which different artists contribute to. 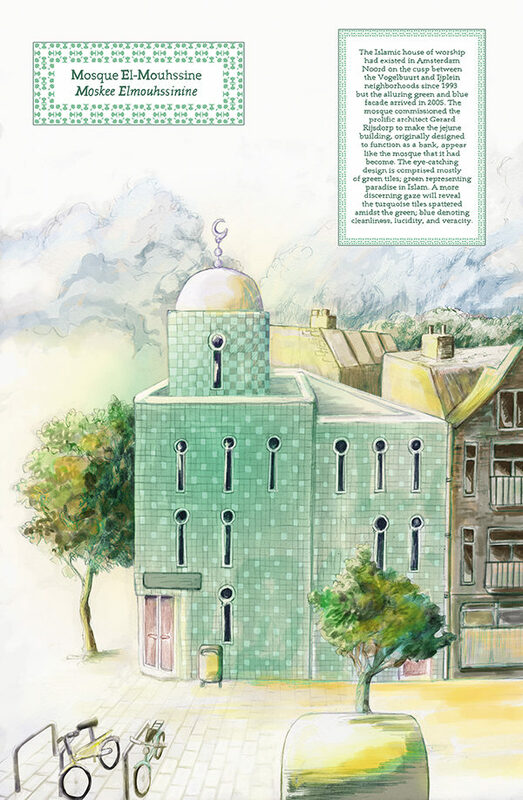 I was asked to draw a mosque situated in Amsterdam North. For this assignment I first used pencils and portrayed the building from a higher angle than I had access to, so I had to stretch my imagination a bit. I aimed for a sense of serenity and sparsity, so I didn’t include too many surroundings in the pencil drawing. It was colored in Photoshop, and I used a light color scheme to get the feel of an aquarel painting. The comic is now published. My name is Pepijn Schermer, and I mostly make illustrations, comics and maps. I draw inspiration from sci-fi, fantasy, surrealism and urbanism. Send a message directly to Pepijn Schermer.